In 2011, the European Union unveiled its energy strategy to 2050, outlining the vision for transforming Europe into a competitive, low-carbon economy. The strategy calls for greater deployment of renewable energy, improved energy efficiency and reduction of GHG emissions. Within this framework, the EU seeks 20% efficiency improvement and emission reduction on 1990 levels, and a 20% share of renewables in the energy mix across member states by 2020. Policies among EU members have largely reflected this mandate and the latest European Commission report suggests members are generally in line to achieve at least one target.15 In 2011, the EU achieved a 17% reduction in GHG emissions on 1990 levels,16 showing progress is being made towards targets. However, the negative growth rates caused by the economic contraction of recent years have also played a role in reducing emissions through lower industrial activity. Additionally, the economic situation has led to policy reversal in EU member states (e.g. the United Kingdom, Spain and Italy) that faced challenges in sustaining high subsidies and investment frameworks for renewables. Overall, the scores of EU28 countries reflect the region’s strategic emphasis on emission reduction and renewable energy targets – half of the EU28 countries score in the upper quartile for their energy security and access, and over 60% score among the top 50 for performance in environmental sustainability. Performance continues to be hindered by reliance on energy imports, with the EU28 average score of 0.22/1 for the relative indicator in line with the global lower quartile threshold of 0.21/1. The energy security challenge of import dependence is further compounded in EU1117 countries whose average expenditure for fuels relative to GDP affords them an average 0.35/1 against the EU1518 average of 0.56/1. The best performer in the EU28 cluster is France with a score of 0.72/1, compared to the lowest performer, Malta, scoring 0.46/1 and ranking 78th globally. Scores across the cluster are highly dispersed, drawing attention to the different levels of economic development of EU member states. With the exception of Italy and Latvia, the spread of rankings shows a split between EU15 Central and Western European largely deindustrialized economies sitting in the top half of the regional rankings, and EU11 Eastern European industrializing economies occupying the lower half. *Spider chart represents average performance of region/cluster for individual EAPI indicators. Low scores close to the centre of the chart; high scores close to the outer circle. The next section of the report compares the performance of EU28 member states against each other by identifying and analysing the key challenges and success stories of the economic cluster across each dimension of the energy triangle. In general, EU28 countries perform well in the economic growth and development dimension of the energy triangle. This is due in part to the combination of low intensity service-led economies and EU-wide efficiency targets mandated under the Energy Efficiency Directive.19 The lower half of the rankings for this dimension are occupied by EU11 countries (except Italy), which have more energy-intensive economies driven by growth in industrial activities, and high import costs relative to GDP. Denmark is the best performing EU28 member state across this dimension, and ranks 4th globally. With a service-led economy (the service sector accounts for 76% of its GDP20), the country has one of the most energy efficient GDPs globally. Additionally, Denmark achieves the lowest spending on fuel imports relative to GDP across EU28 members. Denmark’s long-term energy strategy, set out in the “Roadmap to 2050”, is to become a fossil-fuel free country by 2050. The short-term implementation of the strategy involves efficiency and renewable targets to 2020 which aim to further reduce fuel import costs as well as provide the basis for the development of a renewable sector in the economy. 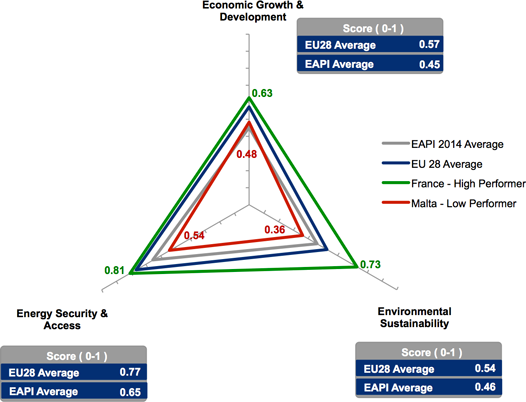 Ranking 60th, Italy is the lowest EU28 performer for this dimension of the energy triangle. Although the country’s economy has an energy intensity of over US$ 12 GDP/unit of energy (comparable to the United Kingdom and Spain), it also imposes some of the highest taxes on gasoline and diesel globally and its electricity prices are among the highest in the EU.21 Like other EU countries, Italy made significant investments in the development of renewables, setting up incentive schemes such as the Tariffa Omnicomprensiva, a feed-in tariff for all power generation up to 1 MW, and the Conto Energia which covers photovoltaic plants and solar heat installations.22 But while this large-scale investment has been instrumental in increasing renewable capacity in Italy, it has provoked questions on the long-term economic sustainability of the measures and the cost to consumers – especially during the period of recession. The cost of the incentive schemes in Italy totalled an estimated € 3.4 billion in 2010, with over 80% of the costs passed on to consumers23. This example highlights how the affordability challenge has impacted the competitiveness of EU industries against other economies with lower cost bases for energy. Performance across the environmental sustainability indicators is overall high among EU28 member countries. The top performers in Europe and globally are France and Sweden, whose nuclear capacity, accounted for as low-carbon energy sources in the index, affords them the top two rankings. The performance of other countries is more varied, with a number of EU15 economies making significant investments in low carbon through increased deployment of renewables and GHG reduction policies. The low performers across these indicators are EU11 economies whose scores are impacted by higher industrial activity relative to their EU15 counterparts, as well as by the low diversification of sources in the energy mix. The environmental performance of France and Sweden is underpinned by the extensive nuclear capacity in the power-generating sector in both countries and the contribution of this capacity to total primary energy supply of 45% and 32%, respectively. This nuclear strategy has led France to have a low-carbon emission power-generating sector compared to EU counterparts. However, France has indicated it may seek to reduce reliance on nuclear from the current 75% of power-generating capacity to 50% by 2025 and diversify into renewable power.24 Similarly, Sweden’s policy landscape for nuclear has been unstable since the decision in 1980 to gradually phase out nuclear capacity, when Sweden started imposing mounting taxes on nuclear power. In 2010, this policy was reversed with life extended in existing power plants and a number of planned additions. Nevertheless, the government does not intend to incentivize nuclear, and no public financing is involved in upgrading existing plants and developing new ones. Investment will be directed instead at renewables and hydro projects. Within the EAPI, nuclear energy is accounted for as a low-emission energy source. However, the negative externalities of nuclear, such as the disposal of radioactive waste, and the potential risks such as accidents and leaks have not been accounted for. Environmental sustainability through renewables EU countries such as Denmark, Germany and Spain have set out their transition pathways through investments and policies to drive expansion of renewable capacity. Spain has increased the contribution of solar and wind energy to TPES from 1% in 2005 to 4% in 2011; similarly, in Denmark the contribution of solar and wind energy grew from 3% to 5% over the same period. Germany, the largest energy consumer in Europe,25 was in 2011 the largest producer of non-hydro renewable energy in Europe. In its Energiewende “Energy Transition” strategy, Germany set out the ambitious goal to phase out its nuclear capacity (following safety concerns due to the Fukushima Daiichi incident), reduce reliance on fossil fuels and improve its environmental performance by investing – and promoting investment – in the renewables market. Current policies include upfront investment support and provisions to allow the resale of surplus renewable energy back to the grid with a feed-in tariff guaranteed for up to 20 years. Through such incentives, renewables grew 10 times faster than the OECD average from 1990 to 2010 and now account for 20% of electricity generation. The closing article of this section provides an industry perspective on the progress of the Energiewende in achieving its goals. The cost challenge of renewable energy, coupled with the availability and comparative low cost of coal over natural gas in the EU – driven by the shale ‘revolution’ in the US – has triggered a return to coal over natural gas in power generation. The EU increased coal imports by 2.8% in 2012, compared to the average 1.3% decline trend of the past decade.26 Because coal generates, on average, twice the amount of GHG emissions as natural gas,27 this trend is having the opposite effect to that targeted by EU renewable policy directives. This highlights the pricing challenge of renewables, as well as the need to build more resilience against price fluctuations in fossil fuels. The environmental challenge of EU11 industrializing economies The lower rankings in environmental sustainability are occupied by EU11 countries – Croatia, the latest country to join the EU in 2013, ranks 103rd and Poland 98th. Although some EU11 countries perform well due to hydro and nuclear capacity (e.g. Latvia and Slovakia), the energy mix of Eastern European countries is dominated by fossil fuels. This is due, in part, to the availability of coal from countries like Poland and Germany, the proximity to Russia as a resource hub and the role of these countries as transit routes for Russian pipelines to Europe. Estonia has one of the most carbon-intensive power-generating sectors globally, placing the country on a global ranking of 123rd; in 2012, CO2 emissions per kWh were comparable to those of Iraq and Mongolia. The country’s power-generating mix is dominated by oil shale, from which the country derives 90% of its electricity production.28 While Estonia’s National Energy Action Plan 2007-2013 set out measures to improve energy efficiency in the power and residential sectors, addressing the diversification of the electricity fuel mix will be instrumental in lowering the country’s energy intensity. EU28 member states, with the exception of Malta and Cyprus, perform well in the energy security and access indicators. Even with the low performers included, the average EU28 score of 0.77/1 sits only marginally below the global upper quartile performance threshold of 0.78/1. Although scores are overall uniform, analysis of the indicators and of individual policy directions shows the discrepancy between high performers such as Denmark that aspire to energy independence and the risks facing import-dependent countries from Eastern Europe. With the exception of Denmark, all EU28 member states are net-energy importers. This, alongside diversity in the source of primary energy supply, contributed to Denmark achieving the top performance across EU28 member states for energy security and access. Aside from production from its North Sea fields which contributes to the country exporting 17% of net energy consumption, energy security in Denmark is also underpinned by the high diversity of TPES created by large-scale developments in renewables, especially wind and biogas, in recent years. With declining oil and gas production, Denmark’s long-term energy strategy is to become energy independent and carbon-neutral by 2050, with all its energy supply for electricity, heating, industry and transport coming from renewable sources. Denmark has approved aggressive targets for renewables, especially wind energy, which currently provides 30% of electricity production, and is expected to reach 50% by 2020. A number of policies such as tax rebates, subsidies, direct contributions and investments in R&D are driving the transition through continued private sector investment. The next step for Denmark is the integration of renewables in the power grid through smart grid solutions to maximize the efficient use of intermittent renewable energy sources. In April 2013, the Danish government launched its Smart Grid Strategy to provide the framework for the development of a smart grid which can combine smart meters read on an hourly basis with variable tariffs and a data hub. The aim is to make it possible for consumers to use power when it is least expensive. For the net-importing countries, scores across the energy security indicators vary widely, with Mediterranean-facing countries overall receiving higher scores than the EU11 countries. Countries such as Lithuania, Poland and Bulgaria face significant energy security challenges due to the low diversification of total primary energy supply, import dependence and low diversification of import partners. Almost entirely reliant on Russia for their supply of energy, these countries face significant energy security challenges. In 2009, a dispute over pricing with Russia caused a severe energy shortage in Ukraine, and highlighted the dangers of over-dependence on a single supplier. To mitigate energy security risks, Poland is building an LNG terminal to enable the import of natural gas from Qatar, starting in 2015. The pricing under the long-term contract with Qatar is expected to be higher than purchasing natural gas from Russia, 29 but Poland has decided to trade off affordability in favour of a more secure supply base. To mitigate energy security risks, more gas grid connections between EU11 countries are expected in the future. There are plans for a Poland-Slovakia link, as well as for links from Hungary, Croatia and the Czech Republic to the Polish LNG terminal. Though still heavily dependent on fuel imports, Mediterranean-facing EU28 countries have successfully diversified their fossil fuel supply – primarily because of their geographic location. Spain – which relies on imports for 75% of its net energy consumption – is the best performer in the indicator on diversification of import counterparts, ranking third globally. This is the result of government policy limiting import quantities per source to ensure security of supply. Italy, France and Portugal are also high performers across this indicator, in part because their geographic location on the Mediterranean facilitates access to supplies from North African countries such as Algeria and Libya. 15 “Climate and energy targets – EU largely on track but mixed picture across Member States”. European Environment Agency (EEA), http://www.eea.europa.eu/media/newsreleases/climate-and-energy-targets-2013. 16 European Commission, http://ec.europa.eu/clima/policies/g-gas/index_en.htm, 2013. 17 EU11: Bulgaria, Croatia, Czech Republic, Estonia, Hungary, Latvia, Lithuania, Poland, Romania, Slovak Republic and Slovenia. 18 EU15: Austria, Belgium, Denmark, Finland, France, Germany, Greece, Ireland, Italy, Luxembourg, Netherlands, Portugal, Spain, Sweden and United Kingdom. 19 On 25 October 2012, the EU adopted the Directive 2012/27/EU on energy efficiency: http://ec.europa.eu/energy/efficiency/eed/eed_en.htm. 20 GDP – composition, by sector of origin (%), The World Factbook, Central Intelligence Agency. 21 Electricity pricing for industry $/kWh; latest available data point in the index is for 2009. Refer to the report’s methodological addendum in the Appendix. 22 Climate and energy country profiles – Key facts and figures for EEA member countries, October 2013. Copenhagen, Denmark: EEA. 23 Investing in Renewables, 2011. KMPG, http://www.kpmg.com/IT/it/IssuesAndInsights/ArticlesPublications/Documents/Investing-in-renewables.pdf. 24 Digges, C. “France vows to lower nuclear dependence to 50 percent by 2025, and commits to new emissions cuts”. Bellona, 2012. http://www.bellona.org/articles/articles_2012/france_nuke_cuts. 25 EIA, Country Analysis, Germany. 26 Redrawing the Energy-Climate Map, June 2013. Paris, France: IEA. 28 EIA, Country Analysis, Estonia. 29 Vukmanovic, O., Barteczko, A. “Poland’s energy security strategy comes at high cost”. Reuters, http://www.reuters.com/article/2013/09/09/poland-energy-lng-idUSL6N0H22WR20130909, 2013.